Is this 7.1 or just the December security patch? I'm sure it is just a patch. 7.1 is probably quite a way off still. Just a guess though. What's the software version and build no.? Try rebooting device. Android 7.0 and higher can download and install firmware updates in the background and all it takes to get it fully finished is a reboot. If that doesn't work download lg bridge on your computer and update it through there. I wish this was some glaring issue with 7.0 that made 7.1.1 a must have for us V20 issues but I'd be dishonest if I wrote that I knew of one. My V20s continue to joyfully rock on with 7.0. Download LG Bridge onto your computer, plug in your phone, then click Software Update. If there's an update, you can download it from there. What's the exact software version? Try rebooting device. 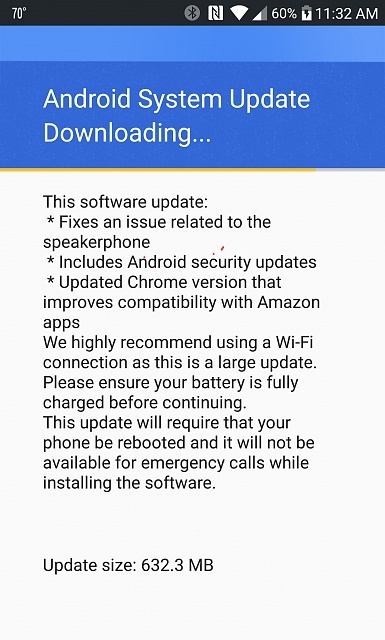 Android 7.0 and higher can download and install firmware updates in the background and all it takes to get it fully finished is a reboot. I know this is an option (yes, OEM's can opt not to use seamless updates), but I was under the impression the V20 wasn't setup for that. The last update I had certainly wasn't seamless. It's not firmware. It's an LG update. SO, it's coming directly from LG? That's normal, but seamless updates also do the updating process in the background too. On mine, it downloaded in the background, but the update process happened during the reboot and took about 20 min. I wonder how long my AT&T phone will say "not updated" in history. If you mean after an update it will clear up in a day or two. Only the Canadian version SM-T805W has no 6.0 update?